You depend heavily on electricity throughout the day, but is your home’s electricity safe? Electrical code violations can put your home and family in danger. 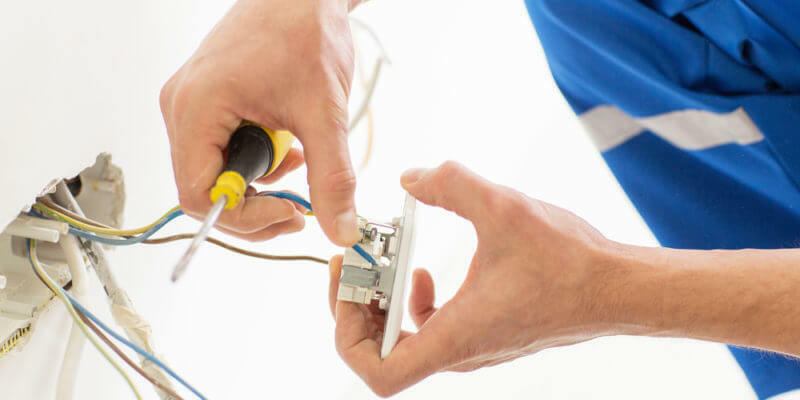 Make sure you avoid these common electrical code violations and keep your family safe by hiring a reputable electrician to make repairs. Knob and tube wiring is considered very dangerous in today’s day-and-age. The wires aren’t grounded, so the circuits support a lower amperage than what is needed today. The wires used in this type of wiring, feature insulation that disintegrates over time. Many insurance companies won’t insure buildings with knob and tube wiring. When to Hire an Electrician to Avoid This Code Violation: If your home was built before 1950 and the wiring has never been updated. A very common wiring mistake is running new light fixtures with old wiring. New fixtures often run at a hotter temperature, overloading wires if they’re older. When to Hire an Electrician to Avoid This Code Violation: If your home has wiring from before 1987. Overcrowding wires is when four or five wires are shoved through a ⅞ inch hole in the wall. This can be extremely dangerous as it leads to damaged wires. When the wires rub against each other, the insulation can be torn off of them, leaving them exposed and a fire hazard. When to Hire an Electrician to Avoid This Code Violation: If your home has more than three wires running through the same ⅞ inch hole in the wall. One of the worst code violations is a splice. This is a connection between two or more wires and is extremely dangerous if not contained inside a junction box. When to Hire an Electrician to Avoid This Code Violation: If you have any wire splices in your home that are not through a junction box.